Here you will find links to Michael Burlingame’s original notes and commentary that correlate with the various pages of this Journal Divided essay. 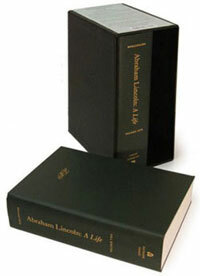 The notes come from Chapter 15 of Abraham Lincoln: A Life (pp. 1680-1684). The full-text PDF of Chapter 15 is available at the Lincoln Studies Center at Knox College. The Journal Divided is a production of the House Divided Project at Dickinson College that offers a new type of interactive online essay format. Essays within this journal include clickable sidenotes that allow readers to see the sources behind the scholarship. They also incorporate other tools designed to help improve the teaching experience, such as audio and video files, and printable PDF handouts. We post both original work from students and younger scholars and also excerpted work from published scholars, such as Lincoln experts Michael Burlingame and Matthew Pinsker. All essays have a comment function activated. Please feel free to leave your questions and suggestions as we try to build a new format for modern scholarship. Those interested in submitting their work to the journal should contact Don Sailer at hdivided@dickinson.edu. Content copyright 2007—2010 by Dickinson College.